Multiple sources reported that at least 12 of 32 NFL teams contacted Peyton Manning’s representatives after he was released by the Colts. 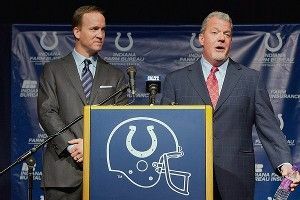 Two were misdials meant for Andrew Luck, three were pranks, and six were condolence calls from people who seemed to think that Manning had actually died. Rex Ryan was the twelfth caller, but he just kept repeating the words “chicken wannggggs” in a throaty whisper. Three more schools punched their tickets to the Dance by winning conference tournaments: Lehigh, LIU Brooklyn, and Montana. Unfortunately, nobody in Montana has been allowed to dance since the governor made it a “communist activity” during the Red Scare, so the team is barred from participating. Lionel Messi became the first player in Champions League history to score five goals in a match as Barcelona crushed Bayer Leverkusen 7-1 in the round of 16. Unfortunately, he has a really long way to go before he can think about breaking Wilt Chamberlain’s record of 100 points in a game. Rangers pitcher Yu Darvish, a much-hyped Japanese prospect, pitched his first two innings of spring training ball yesterday, giving up two doubles and striking out three in a decent outing. He used every weapon in his seven-pitch repertoire, including the pitch where he throws the ball over the batter’s head and then rushes in to tackle him before he can get up, a classic Japanese intimidation move. According to Mexican League Baseball officials, Jose Canseco admitted to taking a banned substance and won’t play in the league as planned this season. The move was a huge disappointment to Mexican fans, who were hoping to enjoy Canseco’s old-school antics before he inevitably said something stupid and was murdered by a cartel.